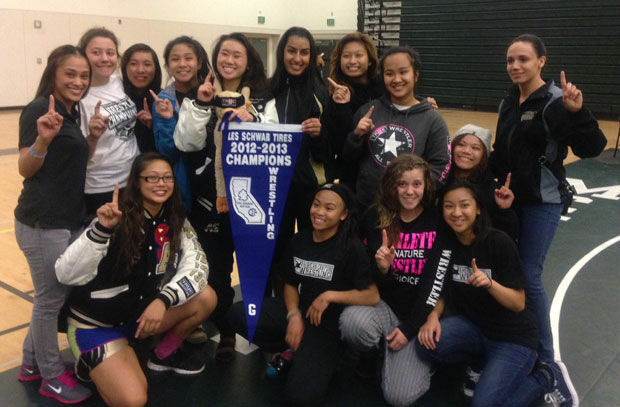 February 06, 2013 9:20 pm • Eagle Staff(0) Comments Led by senior Tina Hoang’s second-place finish at 138 pounds, American Canyon High School claimed the team title at the CIF Sac-Joaquin Section Girls Wrestling Invitational held Friday and Saturday at McNair High in Stockton. By virtue of their top-five individual finishes, Hoang and fifth-place finishers Harpreet “Lucky” Deol (126 pounds) and Micela Medina (98) advanced to the CIF State Championships, scheduled Feb. 22-23 at Lemoore High near Fresno. Zena Truong (103) added a sixth-place finish for American Canyon, which led the 80-team field with 96 points. Livingston was second with 91, Bethel third with 80, and Vallejo fourth with 65. Hoang won her opener with a 30-second pin before posting an impressive first-period pin against the eventual third-place finisher, putting away her foe with just one second left. Hoang beat the eventual fourth-placer in the semifinals by decision, before getting pinned in the second period by Napa High’s Maggie Douma in the final. Deol won her first match and lost her second one, each by first-period pin. But the senior came back with four straight consolations wins — an 8-6 decision and three pins — before getting pinned by the eventual third-place finisher. Deol, however, bounced back with a second-period pin in the fifth-place match. Medina won her first two matches by first- and second-period pins, then was pinned by the eventual runner-up in the semifinals. The sophomore was then pinned late in the second period by the eventual third-placer, but won the fifth-place match with a second-period pin. Truong lost her opener by third-period pin, but climbed through the consolation bracket with a forfeit, second- and first-period pins and a decision, before getting pinned by the eventual third-placer. The junior was also pinned in the fifth-place match. Four other Wolves also contributed points by winning matches. Nilla Mercado (146) was pinned in the second period of her opener by the eventual runner-up. She came back with two consolation wins, via a 26-second pin and an 8-4 decision, before getting pinned by the eventual third-placer. Jada Giron (118) won her first match with a 61-second pin, lost her second with a 65-second pin, then bowed out with a 22-second pin. Victoria Cifelli (132) won her opener with a 15-second pin, then was pinned in 51 seconds by the eventual runner-up, before getting ousted with another first-period pin. Tatianna Oyler (122) was pinned in the second period of her first match by the eventual third-placer, but bounced back with a second-period pin, before getting ousted by Vintage’s Vanessa De Haro with a 39-second pin. Julia Lagrosa was pinned by the eventual fifth-placer before bowing out with an 11-4 loss. Hannah Baquiran (165) lost her first two matches on second-period pins.